In 2015 in Colorado, over 320,000 tons of glass bottles were thrown away – with only 20,000 tons being recycled. That means only 6.25% of glass bottles were recycled! Momentum Recycling will increase the total tons of bottle glass recycled in Colorado from 20,000 to 69,000, thus increasing the glass recycling rate in Colorado from 6.25% to 21.65%. The addition of Momentum Recycling’s new glass processing plant will not require any changes to the way in which Coloradans currently recycle their glass. That is, Colorado residents may continue to place glass in their curbside mixed recycling bins at home. The glass that is collected in the current stream of mixed recyclables will simply be directed now to Momentum Recycling’s facility. Did you know? – Recycling 17 tons of glass offsets the greenhouse gas emissions from 1 car for an entire year. That means this new facility will offset the equivalent of ~2,882 cars/year. 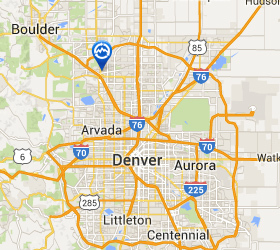 If you have a significant amount of glass, you can bring your glass directly to our Broomfield location shown on the map to the right. Windows: if you are an individual or business with windows to recycle, please click here for more information on recycling your windows for FREE!